With GDC 2017 (Games Developers Conference) in full swing, Nvidia hosted an event, on February 28 2017, where it showed off its upcoming graphics cards. As many people expected Nvidia unveiled the GTX 1080 Ti, its latest top-of-the-range graphics card, at the event. 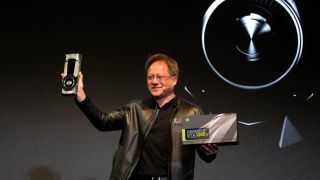 Nvidia didn't have anything to say about the rumored GPU subscription club, however. The Nvidia GTX Gaming Celebration GDC 2017 event kicked off on February 28 at 7PM PT (10PM ET, 3AM GMT Wednesday March 1, 1PM AEST Wednesday March 1). Nvidia hosted a livestream of its GDC 2017 event – and GTX 1080 Ti launch – on its GeForce website, which is now through. The livestream should also be shown on Nvidia’s YouTube channel and Twitch channel. We’ve embedded the Twitch livestream below, which should hopefully switch to a replay of the GDC 2017 event eventually. While Nvidia rival AMD also held an event today, the firm didn't have to do much more than unveil its GTX 1080 Ti graphics card. And, that's about what it did on stage, with a price and release date and everything. Who woulda' thunk?